In verse 3 we see that Simon was willing to allow Jesus to use his livelihood, his boat, as a platform for sharing the Gospel. God asks the same thing from us. He asks to use your career, your athletic ability, your talents as a platform to share the Gospel. In this verse we see that Jesus then calls Simon a step further. He asks Simon to push out into the deep in order to catch some fish. Now Simon’s response is much like our own. He isn’t eager to do it. He tried to explain to Jesus that they’ve been fishing all day and haven’t caught a thing. The tone certainly infers pessimism on Simon’s part. But we see Simon’s willingness yet again; “at your word I will let down the nets.” And what happens? They catch so many fish the nets can barely hold them. The weight of the fish is about to pull the boat under. In fact, it takes two boats to help pull in the large catch. What if Jesus is saying the same thing to us? He has already asked to use our means to share the Gospel. But what if he’s now asking us to keep going? We see that a lot from Jesus. He is consistent in pushing us further. He tells us to forgive our brother and then pushes us to forgive seventy times seven times (Matt. 18:22). He tells us to walk a mile with our enemy and then be willing to walk yet another mile (Matt. 5:41). He’s doing the same thing here. Let him use your means to share the Gospel. Now, push out further from your comfort zone and cast out your net. Take a leap of faith. Try something new. But we often respond like Simon. “It won’t work Lord.” “I’ve been this route before, trust me.” But what if we finished like Simon did. “At your word I will let down the nets.” Could God use our seemingly insignificant lives to reach a “large number of fish”? 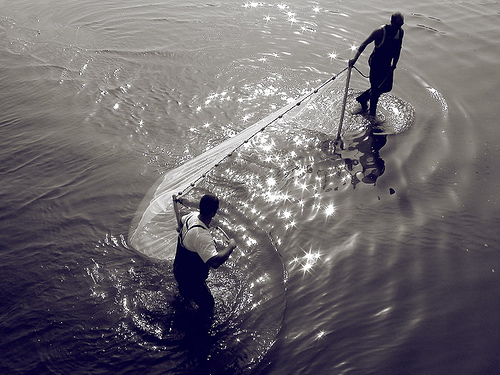 Take time to ask the Lord how you might let down your net. Or better yet, just do it! We’ve mentioned “sphere of influence” before. If you have one, which we all do, then you have an area in which to let down a net. So, let down the net! A quick note, Simon didn’t do anything spectacular. He just made the boat and the nets available. The Lord brought the catch. The same is true for us. Just obediently cast the net and let the Lord control the catch.